1918 (?) Founder Mahesh Prasad Varma (Maharishi Mahesh Yogi) was born. 1955 Maharishi began teaching in India (under the name Bal Brahmachari Mahesh). 1957 The Spiritual Regeneration Movement was founded in India. 1959 Maharishi first visited the United States. 1960 The International Meditation Society (IMS) was founded. 1964 Students International Meditation Society (SIMS) founded. 1967 The Beatles and other meditating celebrities brought publicity to TM. Mid-1970s The number of initiated meditators grew enormously, ultimately approaching one million in the U.S. and seven million worldwide. 1974 Maharishi International University (MIU) was founded in Santa Barbara, California. 1975 MIU (Now Maharishi University of Management or MUM) moved to Fairfield, Iowa. 1976 TM “sidhis” (superpowers) were introduced. 1978-1979 Several thousand committed TM sidhi practitioners moved to Fairfield. 2008- the present The TM Movement survived; celebrity endorsements supported new outreach initiatives. Maharishi Mahesh Yogi (Maharishi, MMY) is the title used by the founder of the TM Movement. “Maharishi” means “great sage” in Sanskrit, Mahesh is believed to be his given name, and “Yogi” is an Indian title given to practitioners of spiritual discipline. In keeping with Hindu monastic traditions, Maharishi did not talk about the life he lived before taking religious vows; consequently, scholars have struggled to construct his biography. While many believe that Maharishi started life as Mahesh Prasad Varma in 1918, even this is not certain. His family name is sometimes given as Srivastava, and several alternate birth dates have been suggested. The future Maharishi studied physics in school and graduated from Allahabad University in 1942. Around this time, he became a disciple of noted Hindu spiritual leader and ecclesiastical dignitary Shri Swami Brahmananda Saraswati (1863-1953), the Shankaracharya of Jyotirmath, one of the four great monastic seats in India. Swami Brahmananda Saraswati, a Brahmin scholar, was deeply revered as a saint during his lifetime, and his reputation as a holy man still endures. Maharishi was not a Brahmin. He was born into a caste of hereditary scribes, the Kayastha. Therefore, by the standards of Hindu orthodoxy, he was not allowed to assume the title and role of guru (giving initiations, accepting disciples, etc. ), though as a renunciate he was permitted to teach about spiritual topics (Humes 2005). His birth as a Kayastha did, however, qualify him to become the personal secretary to Brahmananda Saraswati, known within TM circles as “Guru Dev.” He served Guru Dev as his secretary for roughly a decade. Throughout his later teaching career, MMY studiously avoided the label of guru, claiming simply to be a dedicated transmitter of his own guru’s teaching; however, devout followers, especially in the West, revere MMY as a guru nonetheless. The TM Movement has presented itself to the public in several different ways over the last six decades. In the earliest phase, Maharishi taught within an explicitly religious and spiritual context, as indicated by the name he gave his first organization, “Spiritual Regeneration Movement” (SRM). In 1959, when the SRM was incorporated in California as a 501(c) (3) non-profit organization, its filing papers stated, “This corporation is a religious one, the educational purposes shall be to given (sic) instruction in a simple system of meditation, and the charitable nature of the corporation is to provide a means of such instruction to worthy persons sincerely desirous of leading a more spiritual life,…”(“SRM-Incorporation”). The SRM initially appealed to members of the small, generally affluent, esoterically inclined subcultures then flourishing in Southern California and several other locations in the U.S. and the West (Herrera 2003; Olson 2005). Maharishi presented himself as a Hindu monk, teaching a simple form of mantra meditation he claimed was transmitted to him by his guru, “Guru Dev.” (For what it is worth, some critics claim that MMY developed TM on his own, and it was not taught by Guru Dev.) Perhaps because MMY had studied physics at university, from the beginning of his teaching he made use of analogies and examples drawn from modern western science; however, the scientific nature of meditation was not the main selling point of TM in this early period (Lowe, 2011). From the start, MMY had great ambitions for his movement, hoping that the widespread practice of TM would lead to global transformation. TM was promoted as a panacea for all problems: personal, familial, societal, national, and global. Maharishi claimed that, unlike other forms of meditation, TM was simple, natural, and effortless. Furthermore, its practice required no abstention from worldly pleasures or change in lifestyle. Meditators would enjoy both the spiritual and the material worlds. TM, it was said, would deliver “200% enjoyment of life.” As early as 1960, MMY claimed that if one percent of the world’s population practiced TM, global peace would be assured, and a new age of positivity, prosperity, happiness, health, and longevity would dawn on earth (“Maharishi Effect”). By the mid-1960s, having spent years teaching nonstop around the globe, MMY realized that it would be impossible to initiate enough people on his own to reach his goal of world peace. He therefore began the process of training TM teachers (called “initiators”) who, by following his precise instructions and rote, memorized procedures, would soon dramatically increase the number of practitioners of TM. Maharishi reportedly worried that the “innocence” of TM practice would be lost if initiators studied other meditation techniques or listened to rival teachers. TM is unique and a complete path, he said, so other teachings and teachers should be shunned. New initiators signed pledges vowing to “keep the teaching pure,” with the understanding that deviation from MMY’s prescribed methods would not be tolerated. This emphasis on exclusive and rigid adherence to MMY’s teachings is a prominent feature of the Transcendental Meditation Organization (TMO), as is the common belief that Maharishi was fully enlightened and infallible, unlike competing gurus. A few early TM teacher-training courses were offered in the U.S. and India, but most were held in Europe. Maharishi displayed a fondness for European hotels, using them for his training courses and his personal residences for several decades. By the early 1970s, his travels to North America began tapering off, as aspiring TM initiators came to Europe for instruction. In 1967, the Beatles, several of the Beach Boys, Donovan, and assorted celebrities took up meditation, generating a wave of public interest. A second wave of publicity was triggered in 1975 by Maharishi’s television appearance on The Merv Griffin Show. As TM became more visible, opposition mounted (Goldberg 2010). 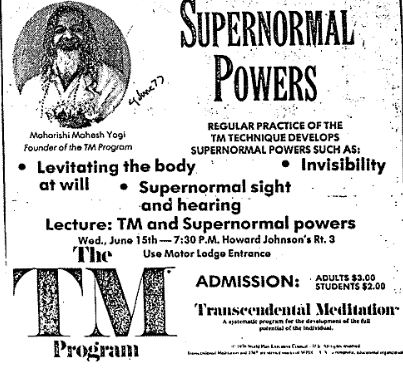 TM was derided as a fad, and critics asserted that TM was a “religious” practice being foisted on an unsuspecting public, a disguised form of Hindu spirituality repackaged for the West. The TM Movement, often simply called “the Movement,” entered a new phase with the 1970 publication of an article in the journal Science, demonstrating that the practice of TM produced tangible physiological changes in meditators. This article in a prestigious, peer-reviewed journal marked a turning point for TM. Maharishi had long asserted that meditation was “scientific,” but now he appeared to have proof. Before this article was published no forms of meditation had been seriously studied; this first article opened the floodgates, both for TM and competing systems of meditation. While the scientific study of meditation is now mainstream, in 1970 this was a remarkable development. Several hundred subsequent studies have attempted to document the many beneficial consequences of both individual and group practice of TM. During the next decade, Maharishi spent a great deal of time engaging in dialogues with notable scientists—some practitioners of TM and others outside the TMO. These videotaped encounters show MMY and his guests searching for parallels between western science and TM (both the practice of meditation and its philosophical underpinnings). Although the validity of TMO-sponsored research has frequently been questioned, the TM movement still features scientific studies prominently in its publications. Since 1970, TM has been presented as a scientific practice; the mystical and religious aspects of TM are strongly deemphasized in public presentations, though they have remained important at advanced levels of instruction. Public lectures are standardized, memorized, and presented with “scientific” charts and diagrams purporting to demonstrate TM’s effectiveness. The steps initiators follow are rigidly prescribed and virtually identical everywhere TM is taught. Initiators adhere to a strict dress code: men have short hair and wear suits; women wear businesslike dresses or skirts. Dignity, middle class respectability, and office worker conformity have replaced the formerly countercultural style of Maharishi’s once youthful corps of teachers (Lowe 2011). In the mid-1970s Maharishi began experimenting with an advanced set of practices that he called “the sidhis.” (Described below in the section Rituals/Practices) These practices ostensibly lead to the development of “superpowers” like clairvoyance, clairaudience, the “strength of an elephant,” and levitation. The TMO used concepts drawn from quantum physics to explain how the sidhis supposedly worked, but skeptics were not impressed. In the face of public ridicule and declining initiations, the TM Movement turned inward, focusing its efforts on those already practicing TM. Many of its centers closed. 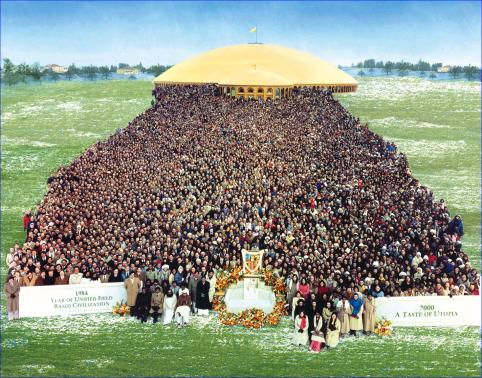 A new emphasis was placed upon massive gatherings of “sidhas” (people practicing the sidhis) called “World Peace Assemblies,” where the group practice of TM and the sidhis was believed to create a powerful force of coherent collective consciousness, “enlivening the unified field,” purifying the atmosphere, and diffusing global tensions. In 1979, Maharishi phoned the first World Peace Assembly, which was taking place in Amherst, Massachusetts, with alarming news and a dramatic proposal. 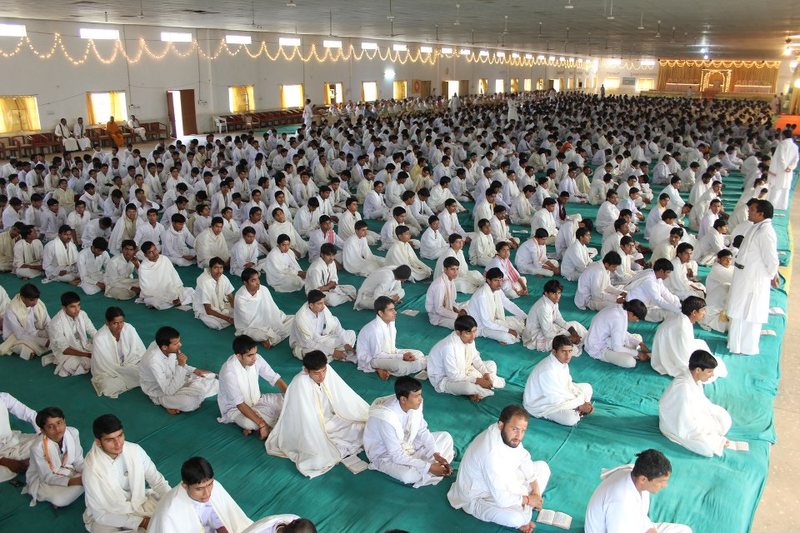 The world was on the verge of destruction, he claimed, and only the TMO could save it by engaging in sustained daily group meditations and sidhi practice. The larger the number of sidhas, the greater the positive effect would be, so gathering a huge group in one place was essential. 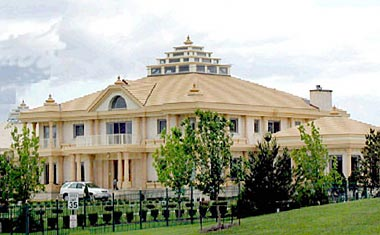 Maharishi begged the nearly 3,000 assembled sidhas to move as soon as possible to Fairfield, Iowa, the home of Maharishi International University (now Maharishi University of Management, or MUM) in order to meditate together and save the world. Despite the numerous hardships this move entailed, more than 2,000 sidhas relocated to Fairfield over the next months, where they soon constituted more than twenty percent of the town’s population. Fairfield would never be the same (Lowe 2010). Two enormous domes, painted gold, were quickly erected on campus to house the gender-segregated group meditation sessions. Other infrastructure improvements to the campus followed. The issue of employment was acute. Fairfield was struggling, and its economy had little capacity to absorb thousands of mostly well-educated outsiders. Fortunately, the sidhas proved inventive and resilient, creating hundreds of new businesses. Some were ephemeral, others thrived; many were remarkably creative, and a few were probably illegal. Over the course of the next four decades, Fairfield’s economy was transformed for the better. Early hostility between the two very different communities has gradually faded. 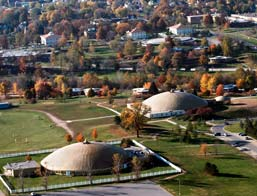 Fairfield is now home to the largest community of sidhas in the western world and has become the de facto center of the TM Movement in North America. It appears that Maharishi understands science simply to mean “a systematically organized body of information.” (This is one of several standard dictionary definitions of science.) “Maharishi Vedic Sciences and Technologies” are not sciences in the modern sense that they have been derived and empirically tested through the scientific method. These sciences and technologies, which include astrology (jyotish) and related uses of gemstones, architecture (sthapatya veda,) North Indian classical music music (gandharva music), medicine (ayurvedic ), fire rituals (yagya), and other teachings, are codified and scientized versions of traditional Indian beliefs and cultural practices. Maharishi created an elaborate network of companies to manage and sell a number of trademarked Vedic products and services, ranging from herbal teas and supplements for daily use to a construction company that erects striking new homes and businesses that face east and incorporate Maharishi’s distinctive design elements. For devout TM practitioners, all of these products and services are beneficial and desirable, though costly. As the TM Movement turned increasingly toward India, sidhas living in Fairfield became emboldened to experiment with other holistic health therapies and even rival meditation methods. By doing this they violated Maharishi’s order to “keep the teaching pure” and met varying degrees of censure. The worst offenders, those meditators who met with rival Hindu gurus (usually called “saints” in Fairfield-speak), were often barred from meditating in the domes. 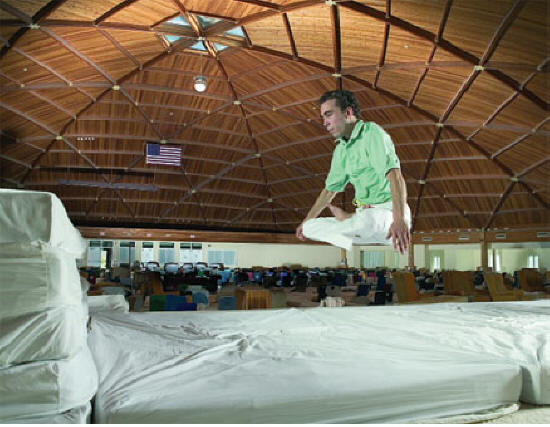 This was a serious punishment for people who had sacrificed their former lives to move to Iowa to create world peace through group meditation. Eventually, so many meditators were barred from the domes that the punishment lost its power, and it became impossible for the TMO to muster the number of sidhas necessary to produce the Maharishi Effect. Perhaps recognizing this, the TMO has recently relented (as of 2012), allowing large numbers of repentant sidhas back into the domes. Fairfield. 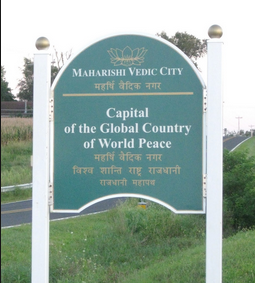 Notable for its street signs in Sanskrit and English, its clusters of Maharishi Sthapatya Vedic homes, its “Vedic Observatory,” and the large administrative buildings of the Global Country of World Peace, the Vedic City purports to serve as a model of ideal community life. After many years of negotiations, the TMO struck a deal with the U.S. Department of State that allows them to bring young Brahmins to Iowa, where they are housed in an isolated, fenced community located just outside the Vedic City suburb. Roughly one thousand Brahmins were living in the compound as of 2012. These young Brahmin ritualists are engaged full time in fire ceremonies (yagnas), devotional worship rituals (pujas) and group meditation/sidhi practice to bolster the millennial efforts of the sidhas in Fairfield. There are reported to be plans to rotate new Brahmins into the US at fixed intervals to replace those due to return to India. Meanwhile, Fairfield has become a major stop on the touring circuit for gurus from India. The TM-inspired community in Fairfield is well schooled in Vedic teachings and provides a fertile ground for proselytizing teachers (Lowe, 2010). The TM Movement is international in scope, so TM communities exist in numerous other locations around the globe. Before his death in 2008, Maharishi had become a recluse, living in his specially constructed sthapatya vedic headquarters in Holland and communicating to his assistants through closed-circuit television (Williamson 2010:80). During his long career, he created a great number of organizational structures, so it is difficult for outsiders to determine who actually makes the decisions for the TMO, now that MMY has departed. Delineating a set of beliefs and doctrines for TM is difficult, because the doctrines of TM differ based on the level of one’s involvement in the TMO. At the lowest level of participation, TM is a “client cult,” a neutral descriptive term coined by religion scholars Rodney Stark and William Sims Bainbridge to denote quasi-religious groups that are run as businesses, offering services to interested customers (1985). While the ultimate goals of client-cults may well be spiritual and/or religious, their public face is that of fee-based organizations that make few if any demands on their customers, beyond payment for services. For the millions who paid for instruction in TM and sought no deeper involvement in the group, the client-cult model is useful and accurate. Individuals pay a substantial sum, go through a ceremony, and are taught to meditate over several days. Then they are free to practice as they see fit, with no further obligations. What they choose to believe is their own business. At this level of involvement, TM is simply a technique for relaxation; its religious roots are minimized. As the introductory lectures emphasize, practicing TM requires no change in belief or lifestyle. Of course, when spokespersons for the TMO claim that TM is “not a religion” and has no required belief system, they are only telling part of the truth. The initiation ceremony (puja) is unambiguously drawn from Hindu sources. The TMO insists on calling them “Vedic,” not Hindu, a subtle and perhaps misleading distinction. The mantras given out in the ceremony can be found in medieval Indian lists of tantric “seed” (bija) mantras, where they are said to invoke deities like Saraswati and Rama. TM initiators were taught by Maharishi that the mantras are “meaningless sounds,” or alternately, “sounds whose effects are known,” and this is what they tell their initiates. This sanitized presentation is quite effective, as demonstrated by the fact that TM is practiced by members of all the world’s major religions. Many, or perhaps most, of them do not feel that TM is in conflict with their religion. Even TM initiators sometimes appear unaware of the “religious” roots of the meditation they teach. When initiates pursue further involvement in TM, by attending advanced lectures, residential meditation and teacher training courses, and purchase advanced meditation techniques and instruction in the “sidhis®” (the TMO trademarked spelling of siddhi, a Sanskrit word meaning “superpowers”), they soon discover that MMY has grounded his teachings in an all-encompassing worldview. Nearly all committed, long-term meditators adopt some of Maharishi’s “Vedic” belief system. Maharishi’s doctrines are founded largely upon the base of Advaita Vedanta, complemented by elaborate proprietary teachings on astrology, gem stones, North Indian classical music, Vedic architecture, ayurvedic medicine and diet, among other things. 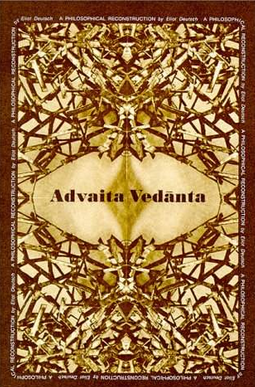 In its most basic formulation, Advaita Vedanta posits an all-pervading consciousness (Brahman) that is the non-dual reality underlying the world of appearances. The Self (Atman), the true nature of every human being, is in fact identical to Brahman. The true essence of the individual is then part and parcel of the essence of the universe, though she or he may not realize it. One important implication of this worldview is the belief that the human body is a microcosm of the universe. The outer structure of the cosmos (the stars, planets, vast space, galaxies, and the like) corresponds in every detail to human physiology. The TMO has created elaborate tables documenting the direct, one-to-one correspondences between the inner and outer worlds. Going further, Maharishi claims that the Veda (understood as both the ancient collections of revealed Sanskrit texts and all true knowledge) shares in this identity. Individual Vedic texts supposedly correspond to specific parts of the human anatomy as well as to various aspects of the universe. Though these correspondences may seem fanciful to outside observers, they are accepted at face value by TM loyalists. Scientists within the TMO are honored and rewarded when they discover evidence supporting claims that Maharishi has long asserted to be fact. For example, a TM website notes that in 1998 “ Professor Tony Nader, M.D., Ph.D., [was] awarded his weight in gold for his historic discovery that the totality of Veda and Vedic Literature, along with all the Devatas [Vedic gods] and the whole cosmos, is located in the physiology of every human being” (“Maharishi Achievements”). Maharishi’s spiritual technologies are based on the manipulation of these detailed macrocosmic/microcosmic correspondences. If the human body, the Veda, and the universe are all structured identically, then actions taken within the body and human consciousness affect the objective outer world. Thinking mantras is not simply a subjective activity; the mental repetition of mantras, done correctly, brings concrete results. Similarly, performing Vedic rituals will change both the physiology of the ritual performers and the objective functioning of the outer world. With proper training, the power generated through mantras and rituals can be directed to benefit others, as seen in Maharishi Vedic Vibration Technology SM and Maharishi Yagyas ® (discussed below). In the early years of his teaching, Maharishi used “Being” as a synonym for Brahman. More recently the term “unified field,” drawn from physics, has taken over that role. Consciousness, understood not as thought but as pure unmediated awareness, is roughly equivalent to Atman. Enlightenment, or liberation, comes from the experiential realization of the non-dual state in which Atman and Brahman (consciousness and the unified field) are one. Maharishi starts with this basic understanding, often expressed in scientific-sounding language, and develops his scheme of spiritual evolution from it. According to Maharishi, humans are capable of experiencing seven states of consciousness, but “stress” (roughly equivalent to karma) stored in the nervous system prevents most humans from experiencing higher states (Campbell 1976). As “stresses” are removed, through the process of meditation and use of Maharishi’s “Vedic technologies,” meditators are believed to pass progressively through the higher states of consciousness. This process of spiritual evolution is thought to happen naturally and almost mechanically, as long as one follows the prescribed path without deviation. The fifth state, “cosmic consciousness,” is supposedly produced by the repeated experience of transcendental consciousness in meditation. Eventually the transcendent state is “stabilized,” so that the meditator experiences transcendent pure consciousness while in the midst of waking, dreaming, or sleeping. This state is also referred to as “witnessing,” meaning that the transcendental blissful state, equated with the Atman of Advaita Vedanta, dispassionately observes, or witnesses, the functioning of the ordinary waking, sleeping and dreaming mind. Critics have claimed that this sounds like a description of depersonalization, a dissociative state viewed as pathological by western psychologists and psychiatrists (Castillo 1990). The TMO would disagree, saying that the resemblance is superficial at best. Cosmic consciousness is viewed as a major step in the evolution towards complete enlightenment. The sixth state, “God consciousness,” is produced by further refinement of the nervous system. In this state, subtle vision is developed, and experiencers presumably see a celestial, transformed world. Maharishi did not speak a great deal about this state, which is, in any case, a temporary stepping stone to the seventh state, unity consciousness. Unity consciousness is the direct, permanent identification of Atman with Brahman, personal consciousness with the unified field. This is the final goal held out for individual meditators, though MMY occasionally alluded to a further development, Brahman consciousness. Brahman consciousness appears to be a form of unity conscious, only somehow better. This claim that the group practice of the TM sidhis can produce a new age is an example of what scholars call “progressive millennialism,” the belief that the world can gradually be brought to a state of perfection. However, Maharishi’s teachings are never so easy to categorize; he has also periodically issued emergency calls for sidhi practitioners to gather by the thousands for World Peace Assemblies in order to prevent the outbreak of wars and other imminent calamities. Scholars call this form of radical preventive action “avertive millennialism.” Devoted practitioners of TM believe that several catastrophes have been prevented by group meditation assemblies over the last four decades. Although Maharishi (1976) repeatedly declared that the “Age of Enlightenment” has already dawned, evidence of this millennial age of peace, prosperity, and happiness has proven difficult to document. The basic practice is, of course, TM, which is taught through a ritual puja in which the initiator invokes and makes offerings to a long tradition of spiritual masters leading up to Maharishi’s guru Swami Brahmananda Saraswati. (Advanced instructions are also preceded by a puja to Guru Dev and the “Holy Tradition.”) The actual initiation into TM takes less than an hour and has been described repeatedly in the media and on the Internet. It is fairly simple. The initiate brings fruit, flowers, and a new cloth handkerchief to the ceremony. These items are presented before a painting of Guru Dev, during a short Sanskrit recitation that takes five minutes or so. The initiator then gestures for the initiate to kneel before the image of Guru Dev and whispers the mantra to be used in meditation. The initiate is told to repeat the mantra more and more quietly, eventually simply thinking it mentally. Further instructions are then given with the goal of ensuring that the process of meditation remains effortless. The new initiate is told to meditate 20 minutes twice a day and return every few months for periodic “checking,” to make sure the process remains effortless. For the new meditator, daily TM is the sole recommended practice. If a practitioner of TM wishes to become more deeply involved, she or he might start with an advanced technique or a “residence course.” A number of different advanced techniques have been taught through the years; most involve adding syllables to the mantra the meditator was given at initiation. Though these techniques are ostensibly secret, they are accurately described on several websites. Residence courses are spiritual retreats held in facilities owned or rented by the TMO that provide an opportunity for extra meditation, rest, and simple hatha yoga practice. Retreat leaders usually give advanced lectures and show videos of Maharishi. 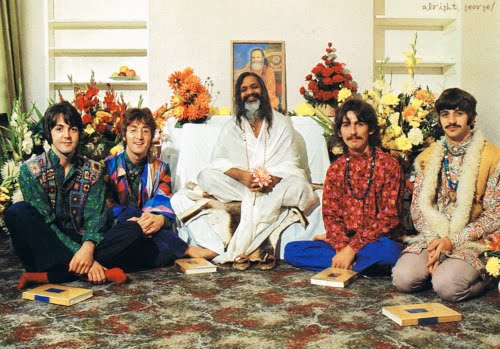 According to the theory behind the Maharishi Effect, group meditation is exponentially more powerful than solitary practice, so great emphasis is placed on creating collective meditation groups, either temporary, as in World Peace Assemblies, or fairly permanent, as is the case in Fairfield and other TM communities. Many sidhas who live outside TM communities will visit them on vacations to contribute to the group effect. Maharishi, like many Indian spiritual teachers, placed great value on celibacy, while recognizing that it was a hard sell in the West. In 1981, he established gender segregated groups—“Mother Divine” for women and “Purusha” for men—that provide basic support for those drawn to lives as celibate professional meditators. Though never the aspiration of most practitioners of TM, a celibate monastic lifestyle is an option for the most committed sidhas. US communities of Mother Divine and Purusha currently exist in Iowa, West Virginia, and New York State, though they have been relocated several times in their three decades of existence. There are a number of goods and services, most derived from traditional Indian cultural or religious practices, that target both the general public and the committed practitioners of TM. All are relatively expensive when compared to similar offerings from other Indian teachers. Adopted en masse, they form a complete lifestyle. Yagyas, Vedic fire ceremonies conducted by Brahmin priests in India, are believed to exert powerful beneficial influences on the lives of patrons. The beneficiaries are neither required nor expected to be present for the ceremonies, because their power is not diluted by distance. Maharishi Vedic Vibration Technology SM is another of the healing techniques offered as a client-cult service to the general public by the TMO. In this, the healer silently recites mantras while blowing on the areas of the patient’s body that are being treated, thereby transmitting beneficent energies. Like most South Asians, Maharishi was a proponent of jyotish (often called “Hindu astrology”). Maharishi Vedic Astrology consultations are remarkably elaborate and detailed. The astrologers working for the TMO often prescribe Maharishi Vedic Yagyas to avert upcoming misfortune and recommend various Maharishi Ayurvedic treatments to improve health, since all these interventions are believed to work synergistically. Maharishi Ayurveda made a splash when it was first introduced, and ayurveda was still new to the general public in the West. In most regards, Maharishi’s version differs little from the traditional ayurvedic practices found throughout India. If anything, the medications used in Maharishi Ayurveda seem generally milder and safer than some of the questionable ayurvedic compounds produced in India. In recent years, less expensive competitors have captured a good deal of the market once held by Maharishi Ayurveda. Although it sounds like a “New Age” creation, using light and gemstone for therapy is, in fact, an ancient Indian practice. The TMO offers Maharishi Light Therapy with Gems®, its own copyrighted version. Maharishi Gandharva Veda music appears to be standard North Indian classical music, a product of the medieval interactions between Persian Sufis and Indian musicians, as pointed out by Cynthia Ann Humes (2008). Maharishi claims that this music is ancient in composition and universal in its appeal. Listening to the prescribed ragas at the correct times of day is believed to produce harmony and bliss such as was experienced in India’s ancient past when the Vedic civilization enjoyed “Heaven on Earth” (Maharishi’s Programmes”). Sthapatya Vedic architecture is perhaps the most visible expression of Maharishi’s Vedic Science and Technologies, at least in areas where TM practitioners are concentrated. Sthapatya Vedic homes can be identified by a number of features: all face due east and have a kalash (dome) over the central area. Many have no windows or doors on the west side. The homes are constructed of all-natural materials and are surrounded by low decorative fences that serve to repel negative energies. Great care is taken to situate the homes according to the principles of vastu (a Sanskrit term roughly equivalent to the Chinese word feng shui). According to Maharishi, a properly sited, proportioned, and constructed home will eliminate nearly all the mundane difficulties of everyday life and ensure health and harmony for its residents. Whatever the spiritual benefits of these homes, they seem well made and attractive (Lowe 2011). The organization of the TMO is both elaborate and opaque. Through the decades, Maharishi created or inspired an amazing number of commercial enterprises and non-profit organizations and institutes, even a political party with branches in 74 nations, each with its own leadership structure. The leadership of these different organizations is largely composed of members of Maharishi’s inner circle, so a relatively few individuals hold multiple leadership positions in numerous, apparently independent organizations all linked in some way to the TMO. To outside observers, the modern TMO might seem more like a highly diversified business than a spiritual movement, though for insiders it is definitely the latter. MMY appears to have held absolute control of the TMO during his life, micromanaging even the smallest details and holding the empire together with his unquestioned spiritual authority. With his death, the TMO seems to be separating into regional organizations with multiple centers of power and authority. At several points over the last few decades, Maharishi purged close disciples who appeared on track to become his successors. The most prominent of these are probably Deepak Chopra and Sri Sri Ravi Shankar. Both Chopra and Shankar have gone on to create flourishing spiritual/business empires of their own. The reasons for these expulsions are not clear; transparency has never been a leading trait of the Movement. Favored leaders have come and gone through the years without explanation. It appears possible that MMY was threatened by the perceived “charisma” of some of his leading disciples and therefore expelled them. Perhaps reflecting this concern, the leaders Maharishi ultimately left in charge of the TMO are not noted for personal magnetism and do not appear to have attracted devoted personal followings. Further complicating matters, before his death Maharishi crowned several dozen kings (rajas), each of whom has jurisdiction over one or more countries. In theory, Tony Nader, a Lebanese M.D., Ph.D. whom Maharishi crowned as Maharaja Adiraja Raam Nader (Great King Primary King Rama Nader), should be the global leader of the TMO. He was declared to be the ruler of the universe as well as the supreme king overseeing Maharishi’s other rajas, but it is not clear how much power he actually holds. Maharishi’s relatives seem to be struggling for control of the TMO in India (Ray 2012). Dr. John Hagelin, a Harvard educated physicist, is the raja for “Invincible America,” the head of many TMO institutes, the three-time Natural Law Party candidate for president of the U.S., and certainly one of the most powerful leaders of the Movement in North America. Bevan Morris, the president of MUM and Prime Minister of the Global Country of World Peace, among many other duties, seems to be a major player as well. Challenges faced by the TMO include the question of long-term governance (discussed above). Sociologists of religion have often observed that new religious movements centered on charismatic leaders are especially vulnerable when their founders die. Maharishi appears to have left a financially viable organization, but one that is so complex, decentralized, and organizationally convoluted that it may prove difficult for its current leadership to manage. Without the vision and unquestioned authority of a single powerful leader, the organization might be expected to struggle. However, so far, the TMO in the U.S. seems to be embarking on new initiatives with renewed energy, once again using celebrity endorsements to enhance its public image. The David Lynch Foundation is especially visible in this regard, conducting numerous gala fundraising events and defraying the costs for more than 200,000 individuals to learn TM in the last few years (Orsati 2012). In the West, the TMO appears to be surviving the crisis of its founder’s death rather well; however, media reports suggest that Maharishi’s holdings in India are in disarray (Ray 2012). Claims that the TM technique is a crypto-religious practice continue to pose difficulties for the Movement, especially as it makes new attempts to teach meditation in schools, businesses, the military, and prisons. Of course, the TMO asserts that TM and its related practices are scientific, not religious. Whether TM and Maharishi’s spiritual teachings are “religious” for individual meditators depends largely on the level of commitment they have to the underlying belief structures and advanced practices. When looking at the TM Movement as a whole, definitions are critical. Science and religion are both words with multiple meanings and surprisingly diverse definitions. By some definitions of religion, the belief system and elaborate practices of the most committed practitioners of TM clearly qualify as “religion,” making the TMO a new religious movement. By other definitions they do not. The same definitional issues arise when evaluating Maharishi’s teachings as “science.” Without providing universally accepted definitions of “religion” and “science,” all assertions about the “true” nature of TM will surely be contested. The 1979 court case Malnak v. Yogi determined that the “Science of Creative Intelligence,” a course on the ideological underpinnings of TM that was being offered by the TMO to meditating students in two New Jersey public high schools, was in fact religious in nature. While courts may not always be the most competent authorities to address religious questions, their decisions carry weight and set legal precedents. Given the court decision and the fact that the advanced practices and services sold by the TMO look “religious” to most observers, however they define religion, the TMO is fighting an uphill battle. The puja performed during the initiation ceremony and the mantras used in TM are commonly understood in India to invoke Hindu gurus and gods (devas) respectively, yet most western meditators believe the ceremony to be a mere formality and the mantras to be “meaningless sounds.” As already discussed, it is not clear that the practice of TM is “religious” for most ordinary meditators, despite how it might appear to outside observers. The TMO insists that TM is compatible with the practice of all religions, and several million meditators, adhering to a wide range of the world’s religions, sincerely believe this to be the case. When Jewish rabbis, Protestant ministers, and Catholic priests claim that their practice of TM is not in conflict with their religious beliefs and practices and, in fact, has enhanced their religious understanding, commitment, and faith, their assertions should be taken at face value. They are presenting their experiences and their truths. Of course, this is not the whole story. The high commitment and devotion shown by those who have continued on the path of TM, pursuing advanced techniques, attending teacher training, going on retreats, and moving to TM-focused communities—are indicative of much deeper levels of existential investment. A visitor to Fairfield, Iowa, the nearby Maharishi Vedic City, or other TM communities will see that, in practice, Maharishi’s teachings can, and do, provide a totalistic, highly prescriptive, all-consuming lifestyle for thousands of devoted followers of the Movement. For these practitioners of TM, meditation, the sidhis, and the wide range of related practices and services constitute a complete spiritual path, an “ultimate concern,” whether you call it a religion or not. In its dealings with meditators fully committed to TM, the Movement can be highly controlling and intolerant of deviations, encouraging orthodox thinking and enforcing orthopraxy. By most standards, TM looks and behaves like a new religious movement, at least for its most devout followers. Critics also question the claim that the practice of TM is always beneficial. In contrast to the glowing testimonials on Movement websites, a 1980 German study suggests that individuals who continue to practice TM over many years show less psychological stability than demographically comparable non-meditators. This critical study, like many positive studies of meditators, lacks a control group, so the findings are far from conclusive. The number of ex-meditators studied was small (n=27), as well, making the methodology more qualitative than quantitative. While the study demonstrates that some long-term meditators do not display perfect mental health, their mental states before starting TM are unknown, and so it is impossible to prove that TM was the cause of their current conditions. The entire report is archived online (“The Various Implications Arising from the Practice of Transcendental Meditation” 1980). Although this study is flawed, many observers have noted that the TMO understates the psychological problems that arise for some meditators. Maharishi certainly dismissed the possibility that TM might cause harm to fragile or susceptible individuals, despite evidence to the contrary. Readily available anecdotal evidence strongly indicates that TM, and especially extended meditation retreats and advanced practices, may have harmful effects on an unknown percentage of TM practitioners. When meditators experience psychological difficulties, the official TMO responses seem ineffective. For just one example, see Antony Barnett’s report on a murder at MUM (Barnett 2004). The TMO not only has to ward off charges of being a religion, it also needs to defend itself against the contradictory charge that it is simply a lucrative business enterprise and not spiritual at all. Through the years, Maharishi led the TMO to amass a great deal of real estate around the globe. Although the properties were often acquired after intensive fund raising for specific purposes, like building new centers, schools, amusement parks, residential facilities, and “peace palaces,” the majority of these projects were never begun, much less completed. The money raised for these projects was seldom if ever returned to donors, and it appears that much of the land purchased for abandoned projects remained within the TMO’s portfolio. As a result, the TMO’s various branches are thought to own large amounts of real estate (Fowler 2003). According to Indian journalist Shantanu Guha Ray (2012), Maharishi’s various enterprises in India hold property worth nearly eleven billion dollars ( U.S.)! The various commercial enterprises run under Maharishi’s name have also presumably made significant amounts of money, though their finances are not open to public scrutiny. The TMO’s pretentions to global governance also raise concerns. As indicated above, many of the TM front organizations have quasi-governmental names and missions (eg. World Plan Executive Council, World Government of the Age of Enlightenment, Global Country of World Peace, etc.) These names are hardly accidental. When you consider the titles MMY gave to advanced practitioners and Movement leaders, like Governor (for initiators who practice the sidhis), or Raja (for high level TM dignitaries), and the attempts by the TMO to create an international political organization (the Natural Law Party) and lease autonomous “micro Kingdoms” within developing nations, a pattern seems clear. The TMO has even created its own currency (the Raam), which it has attempted to use internationally. While it seems most likely that Maharishi’s talk of world rule should be understood figuratively, with governance taking place only “on the level of consciousness,” the TMO’s aspirations have raised eyebrows worldwide. Perhaps the most disturbing controversy involving the TMO centers on the living conditions of the thousand or so young Brahmin males housed in a fenced, guarded enclosure north of Fairfield. These young men were brought to the U.S. to meditate and conduct rituals full time, with the goal of bolstering the Maharishi Effect generated in the golden domes. What makes this controversial, as opposed to merely eccentric, is that the young men are isolated from nearly all contact with the outside world. Critics charge that the men are being held incommunicado and are, in fact, physically confined in an unusual, though perhaps voluntary, form of indentured servitude. In keeping with its general lack of transparency, the TMO has not been forthcoming with explanations. For more than five decades the TMO has demonstrated an ability to adapt its message to new times and new audiences. Whether that skill came from its founder or the organization itself should become clear over the next few years. The TMO’s basic product, Transcendental Meditation, has survived numerous ups and downs in popularity and faces greater competition now than ever in the past. However, relaxation and inner peace have rarely been in greater demand. With skillful marketing and claims to uniqueness and effortlessness, TM may retain a specialized niche in the spiritual marketplace for years to come. Similarly, the TMO’s many client-cult services seem to be enduring as well. However, the greying of the siddha population is clearly visible in Fairfield and other TM communities, leaving the long-term future of the TMO as a viable new religious movement in question. Barnett, Antony. 2004. “ Trouble in Transcendental Paradise as Murder Rocks the Maharishi University.”The Observer, May 1. Accessed from http://www.guardian.co.uk/world/2004/may/02/usa.theobserver on 20 April 2013. Campbell, Anthony. 1976. TM and the Nature of Enlightenment. New York: Harper and Row. Castillo, Richard J. 1990. “Depersonalization and Meditation.” Psychiatry: Interpersonal and Biological Processes 53:158-68.
de Herrera, Nancy Cook. 2003. All You Need Is Love. San Diego: Jodere Group. Fowler, Jimmy. 2003. “The Real Estate Guru.” D Magazine, September 1. Accessed from http://www.dmagazine.com/Home/2003/09/01/The_Real_Estate_Guru.aspx on 18 April 2013. Goldberg, Phillip. 2010. American Veda: From Emerson and the Beatles to Yoga and Meditation—How Indian Spirituality Changed the West. New York: Harmony Books. Humes, Cynthia Ann. 2008. “Maharishi Ayur-Veda.” Pp. 309-32 in Modern and Global Ayurveda: Pluralism and Paradigms, edited by Fredrick Smith and Dagmar Wujastyk. State University of New York Press. Humes, Cynthia Ann. 2005. “Maharishi Mahesh Yogi: Beyond the TM Technique.” Pp. 55-80 in Gurus In America, edited by Thomas Forsthoefel and Cynthia Ann Humes. State University of New York Press. Lowe, Scott. 2011. “Transcendental Meditation, Vedic Science, and Science.” Nova Religio 14:54-76). Lowe, Scott. 2010. “The Neo-Hindu Transformation of an Iowa Town.” Nova Religio 13: 81-91. 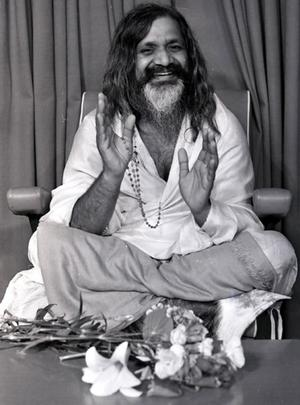 Maharishi Mahesh Yogi. 1976. Creating an Ideal Society: A Global Undertaking. Washington , D.C .: Age of Enlightenment Press. “Maharishi Achievements.” Accessed from http://www.maharishiindia.org/maharishi/maharishi_achievements.html on 10 April 2013. “Maharishi Effect.” Accessed from http://www.mum.edu/m_effect/ on 4 April 2013.
http://maharishi-programmes.globalgoodnews.com/vedic-music/index.html on 5 April 2013. Olson, Helena and Olsen, Ronald. 2005. His Holiness Maharishi Mahesh Yogi: A Living Saint for the New Millennium. New Delhi: New Age Books. Orsatte, Mario. 2012. “Transcendental Meditation Blog,” January 21. Accessed from http://www.tm.org/blog/video/dlf-la/ on 2 April 2013. Ray, Shantanu Guha. 2012. “Yogi’s Disciples Contort His Legacy.” India Today, June 23. Accessed from http://indiatoday.intoday.in/story/maharishi-mahesh-yogi-rs-60000-crore-fortune/1/201925.html on 10 April 2013. “SRM-Incorporation.” Accessed from http://minet.org/Documents/srm-incorporation on 2 April 2013. Stark, Rodney and Bainbridge, William Sims. 1985. The Future of Religion: Secularization, Revival and Cult Formation. Berkeley: University of California Press. “The Various Implications Arising from the Practice of Transcendental Meditation: An Empirical Analysis of Pathogenic Structures as an Aid in Counseling.” 1980. Bensheim, Germany: Institute for Youth and Society. Accessed from http://minet.org/www.trancenet.net/research/toc.shtml on 20 April 2013.